For cooperative businesses, October brings more than all things pumpkin and masses of Halloween paraphernalia. October is National Cooperative Month, a 50-year-old tradition and time for co-ops across the country to reflect on their principles and share the value of cooperative membership with others. 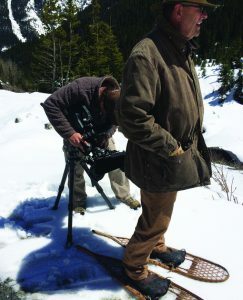 This year, it also happens to be the month that the team at Durango-based film production company Inspirit Creative is putting the final touches on “Pioneering Power,” a documentary exploring the birth of electrical power generation in the mountains of southwestern Colorado and the formidable challenges faced by the people who changed history. 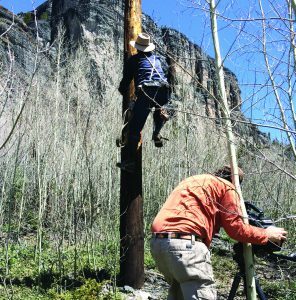 Cameraman, Jay Kriss, captures lineman KJ Johnson climbing a pole the way it was done in the early years of the industry. Immersing himself in his subject is key to the documentary-making process, Kriss explained. When the film industry veteran is seeking a documentary idea, he looks for a major event, individuals to tell about it and a strong archival source to help bring the event to life. Kriss’ award-winning 2012 documentary “Harvesting the High Plains” centers around the story of two men and how their innovative farming practices developed during the Dust Bowl ended up creating one of the nation’s largest wheat-farming operations. “Documentary films are different; the development process takes some time,” said Kriss. “I spend a lot of time reading and looking at the social implications, particularly in the West.” After a year of planning and research in places like the Washington, D.C., National Archives, Cornell University and the Center of Southwest Studies at Fort Lewis College in Durango, Kriss and Associate Producer and Co-Director Christina Knickerbocker launched production in August 2015. The team traveled extensively for months, shooting more than 35 hours of footage at locations that included Idaho, Utah, Colorado and New Mexico. Some original structures and power lines, built mainly to serve a booming mining industry, that are still in use today made the footage and re-enactments especially compelling. “When you think about our history, it’s so new, it’s almost frightening,” Kriss said. Alex Shelley of SMPA at the Ames Hydroelectric Plant. 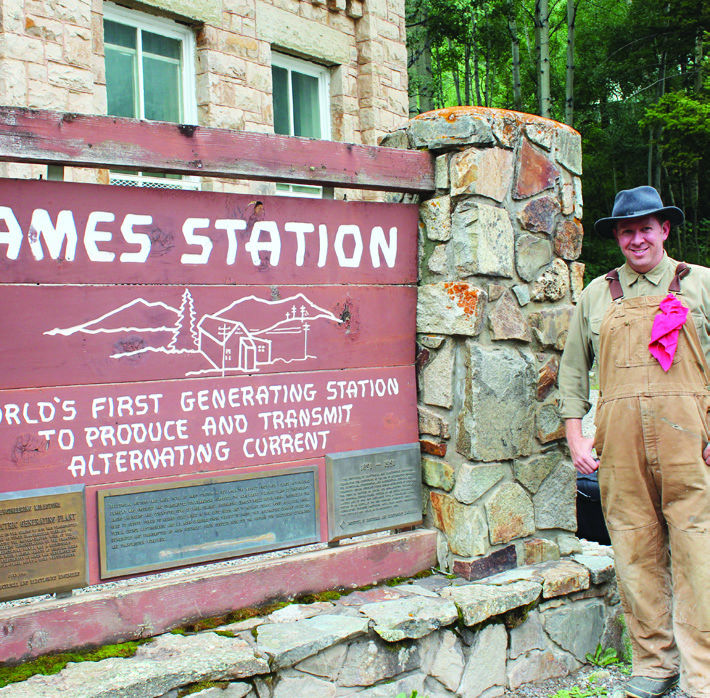 In Colorado, the film crew trekked to sites like the historic Ames Hydroelectric Plant outside Ophir, Camp Bird Mine near Ouray, Bridal Veil Falls overlooking Telluride, the wooden flumes at Cascade Creek in LaPlata County and the Tacoma Hydroelectric Plant, which is accessible only via the Durango and Silverton Narrow Gauge Railroad. 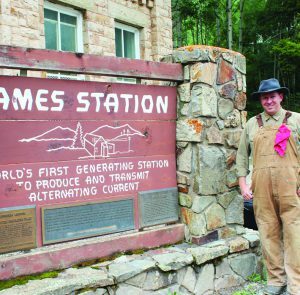 The 80-minute documentary will cover the work of industry heavy-hitters Thomas Alva Edison, George Westinghouse, Tesla and the Nunn brothers; the world’s first commercial alternating current, or AC, power station built in Colorado in 1891; and the monumental change that electric power generation and transmission brought to life in the West. The film’s journey culminates with the authorization of the Rural Electrification Act, which subsequently led to the formation of today’s electric cooperatives. KJ Johnson and Tom McLeod of SMPA helped create period scenes. Turns out Johnson is a man of many talents. He is also a boot repairman and helped adapt the linemen’s boots to be historically accurate by putting leather soles on them. He did similar work for Quentin Tarantino’s Western movie “The Hateful Eight,” filmed near Telluride in 2015. Snowshoes have always been part of a mountain lineman’s necessary equipment. Along with SMPA, the support of HiLine Utility Supply, the Colorado Rural Electric Association, Tri-State Generation and Transmission Association, Xcel Energy and viewer donations made through Colorado Public Television (CPT12) helped make “Pioneering Power” a reality. In large part, it’s an investment in education. “Documentaries can be powerful teaching tools,” Kriss said. The project includes a shorter companion film titled “Power Today,” and features discussions with linemen and information on today’s wind, coal, solar and hydroelectric power generation sources. The curriculum will accompany the film as a packet available through the Public Broadcasting Service. 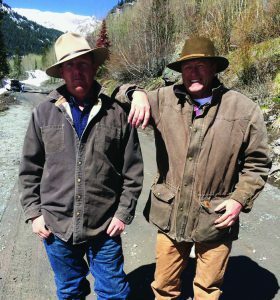 It is set to premier in Durango, followed by early showings in other locations that provided assistance. Its television premier will be presented by CPT12 during prime time in upcoming months. It will ultimately be seen nationally on PBS in more than 20 million households, followed by a home DVD release through PBS and will be available later on Amazon, Netflix and other outlets. Learn more about the project at cpt12.org/local/production-partners/pioneering-power andfacebook.com/pioneeringpower. Mary Peck is a freelance writer with a history of working with and writing for Colorado’s electric co-ops. 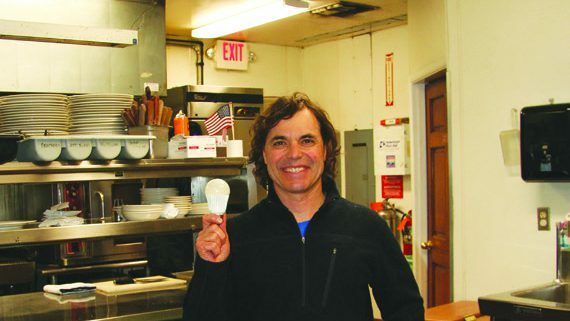 Paul Gelose’s businesses, The Palace Restaurant and the Quiet Lay Tavern in downtown Durango, are now 100 percent LED. With more than 7,000 square feet of space, including two dining rooms, the tavern, three kitchen areas, restrooms, an extensive patio and a full basement of nooks and crannies, the lighting solutions spanned the gamut. The retrofit took three years due to availability of products and bottom line costs. Project specialist Ray Pierotti, from La Plata Electric Association, the local electric cooperative, says that The Palace kitchen is probably one of the best lit in Durango. The new LED fluorescents already led to increased productivity, enhanced visibility for cleaning and safety, and reduction in air conditioning because LED lights emit little to no heat. In the dining areas and tavern – which were the last rooms to completely retrofit as decorative lighting is just coming to the market – the light is now uniform, consistent and pleasing for patrons. Gelose solved previously problematic lighting issues. For example, the stained glass skylight units that require three or four employees to remove the glass just to replace the lights now have LED strip lighting. With a much longer lifespan than incandescents, that laborious task won’t come around again for a long time. “In 20 years, for the most part, these have never been lit up, so now all these beautiful stained glass skylights can shine at night and last for the next 20 years,” Gelose says. Over the years, LPEA gave more than $750,000 in LED rebates – which come directly from Tri-State Generation and Transmission – to 525 commercial customers who reduced energy consumption by nearly 3 megawatts. Project One: Owned by the city of Ouray and built off an abandoned 6-inch water line that ran through town, this hydro facility is the product of a visionary citizen and former mayor of Ouray, Bob Risch. Up against funding, engineering and construction challenges, Risch’s vision became a community-building, energy-harnessing, money-saving reality. Project Two: The San Juan Historical Society Mayflower Mill hydro-plant in Silverton. In order to become a legally established generator, small hydro plants such as this one had to tackle onerous federal regulations originally developed for projects like the Hoover Dam. Usually, such regulations become deal breakers for such small systems. But because of the influence and persistence of Mayflower Mill developers like Beverly Rich and Kurt Johnson, federal regulations were drastically improved to make licensing for small hydro projects attainable. New regulations for this and other small hydro projects were established because of their persistence. Project Three: Located in Nucla and single-handedly developed by Terry Boekhout, this hydro facility came to be despite the risky environment that shrouds nearly every aspect of hydro-electricity generation. 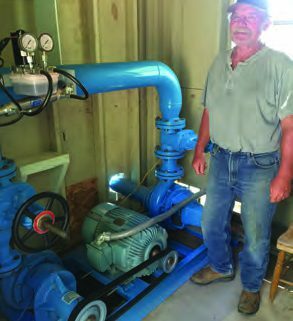 Unknown project costs, elusive government and utility incentives, tricky National Electric Code requirements and the utility net metering policy were all obstacles in the development of this small-hydro facility. Boekhout was the glue that kept the construction of the project, including the penstock, the inlet and outlet, the generator house, the overall design of the site, and all the other unknowns, from flying out of control. While the challenges are many, each project has been made possible through the efforts of these passionate individuals and the cooperation of their local electric cooperative. Each hydro project is vastly unique, but each is also driven by individuals who are willing to transcend the risk move ahead with their vision. This is the true mark of a pioneer. GCEA members can also go green by participating in its Green Power Program. The program gives members the choice of powering their homes with clean energy. GCEA purchases green power at a premium from its power supplier, Tri-State Generation and Transmission, and passes the cost of green power to participating members. Electric co-ops in Colorado will be partnering with the Colorado Energy Office, which recently announced a $1.1 million U.S. Department of Agriculture award to help finance energy efficiency improvements for Colorado farmers. The award comes through USDA’s Natural Resources Conservation Service’s Regional Conservation Partnership Program and is matched through a $1.3 million cash and in-kind combined contribution from CEO, the Colorado Department of Agriculture and utility and industry partners such as Colorado’s electric cooperatives. The funds will help finance energy and water saving projects identified through CEO’s Colorado Dairy and Irrigation Efficiency Program. Over the two-year grant period, the efficiency improvements are expected to achieve more than 5,250 megawatt-hours of electricity savings and 524,000 gallons of water savings annually. “Over the last two years the Colorado Energy Office laid the foundation and identified significant opportunities for cost-effective energy savings in Colorado’s agriculture industry. Having USDA on-board as a funding partner helps overcome the upfront investment barrier so farmers can affordably build out projects that can provide long-term savings,” said CEO Director Jeff Ackermann. The electric co-ops were an integral part of the program when it was launched in 2015 in territory served by Morgan County Rural Electric Association and Highline Electric Association. Its purpose was to provide agricultural producers free energy audits and technical assistance designed to select and implement cost-effective improvements that will reduce energy, water and operating costs. So far, 63 producers have participated and 2,800 MWh of potential electricity savings have been identified through the audits. The program will expand to 200 producers during the next two years and is expected to generate more than $4.5 million in potential savings in only five years. “This grant will enable the implementation of cost-effective projects identified through Colorado’s statewide program, while meeting NRCS’s goal to integrate energy conservation into agricultural practices,” said Clint Evans, state conservationist for the USDA Natural Resource Conservation Service. Colorado’s agriculture industry faces direct energy expenses of more than $400 million annually that account for 7 percent of the industry’s overall expenses, according to CEO’s 2013 Agricultural Energy Market Research Report. The report identifies 90,000 MWh of potential electricity savings annually and identifies dairies and irrigators as the most energy intense sectors with the greatest opportunity for savings. In two months, Americans will go to the polls and cast votes for a president, 34 senators, 435 members of Congress, 12 governors, 5,920 state legislators and countless other local races. While the presidential race is at the top of most voters’ minds, it is the state and local races that have a more direct and immediate impact on the “kitchen table” issues that matter most to families. For rural America, the stakes in this election are especially high. That same report found that rural America continues to experience population decline driven by migration of residents to larger urban areas. The trends underlying much of this migration — issues such as globalization, technology advances and the shift from a manufacturing-based economy to a service-and knowledge-based economy — are largely beyond the control of any community, state or even country. If rural America is to enjoy a prosperous future, it will be thanks to the ingenuity, self-reliance and determination of its people. 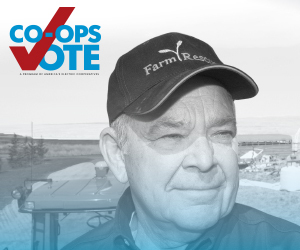 One program that is particularly relevant today is the Co-ops Vote initiative. This nonpartisan, nationwide program is designed to promote civic engagement and voter participation in communities served by electric cooperatives. Visitors to the website can also take a pledge to be a co-op voter. By taking this pledge, they can send a message to candidates at all levels of government that electric cooperative members will be showing up at the polls in force and are paying close attention to the issues that impact the quality of life in their communities. To answer the call for more rural leaders, America’s electric cooperatives created the Washington, D.C., Youth Tour program. Each year, approximately 1,700 high school students representing electric cooperatives from across the nation converge in Washington, D.C., for a weeklong, all-expense paid leadership development experience. Several previous Youth Tour participants became university presidents, CEOs of Fortune 500 companies and members of Congress. Many more returned home to serve in the many underappreciated leadership roles — coaches, small-business owners, church deacons, county commissioners — that form the backbone of our communities. Members of cooperatives are empowered to explore different approaches to solving problems and figure out what solutions are best for their community. This applies to the energy sources they use to generate electricity, the technologies they use to operate the system and the policies and procedures they adopt. What works for co-op members in Colorado might not be right for co-op members in Oregon. The same holds true for rural economic development, according to Harvard Business School’s Institute for Strategy & Competitiveness. While many rural communities face similar challenges driven by similar factors, the best way to address those issues can vary widely from community to community. When electric cooperatives brought electricity to rural America, the playing field leveled and small towns experienced a renaissance. A similar trend is unfolding as broadband access makes its way to more rural communities. One recent high-profile example involves Christopher Ingraham, a data journalist at The Washington Post. In 2015, he wrote a short article based on a data set from the USDA that ranked American communities on qualities that are often indicators of desirable places to live. The community with the lowest score in the USDA ranking was Red Lake County in Minnesota. His story generated a lot of comments, including many from the people of Red Lake County who encouraged him to come out for a visit. He did, and was struck by the kindness of the residents and beauty of the landscape. As a journalist who writes about data, Ingraham isn’t tied to any particular location. As long as he has a reliable high-speed internet connection, he can download the government data sets he needs to do his job and email his editor the finished stories. In March of this year, he announced in another story that Red Lake County won him over, and he planned to move there with his wife and young children. He can make this move because of high-speed broadband. The shift to a knowledge-based economy might be hurting some traditional rural industries, but as more and more companies embrace “teleworking,” employees who were forced to move to large cities to work in certain industries can keep their jobs while working remotely from rural communities. Expanding access to broadband in rural areas is one of the key issues addressed by the Co-ops Vote program, and Ingraham’s story is just one example why. The challenges facing rural America will not be solved by one person, one idea or one action. But on November 8, we will determine which leaders we trust to enact policies that will help small communities help themselves. Study the issues that are critical to the future of your community, look at the positions and backgrounds of every candidate running for every race from president to county road commissioner, decide which ones are best qualified to address these issues and then join millions of fellow electric cooperative members at the polls.